Club holds highest meeting in the world to raise awareness of suicide. AMC on top of Kilimanjaro, left to right: Declan Storey, Eddie McConnell, Liam Munn, Adam McClintock, Alex McClintock, Paul Waterworth and Luke Ambler. 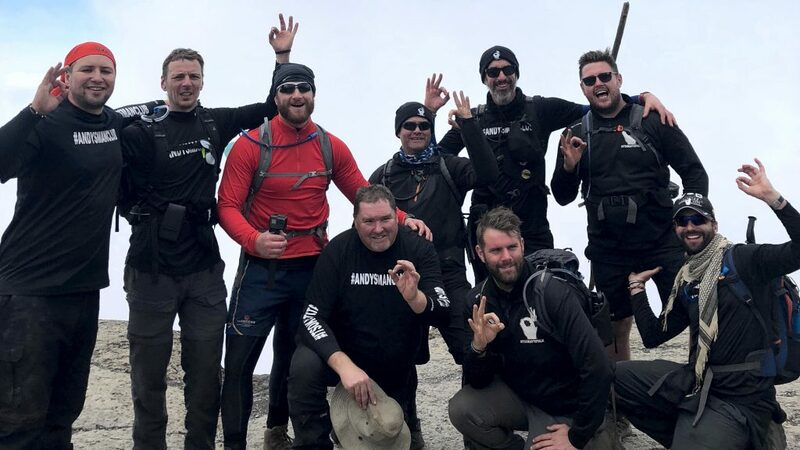 Andy’s Man Club Hull is on a high, literally, from reaching the 5,756 meter summit of Mount Kilimanjaro recently, to celebrating the Club’s first birthday and achieving charity status. Elated, exhausted and emotional, five of the Trustees of Andy’s Man Club UK held a meeting on the roof of Africa, following the arduous six day climb to the top of Kilimanjaro in Tanzania. The founder, Luke Ambler and four other Trustees from around the UK, including Leon McQuade, leader of the Hull group, hiked to the top with a local guide team who were so impressed to hear about the group’s work, they are now also setting up a Tanzanian group to spread the word that it’s of for men to talk, in order to reduce the cases of male suicide on their continent. This is no time to rest for Andy’s Man Club Hull, the team is running a series of activities to raise funds for the charity to enable new clubs to set up in addition to the twenty one already thriving around the UK. The aim is to cut suicide rates by half, a tenacious goal that they are striving to achieve. Be the first to comment on "Club holds highest meeting in the world to raise awareness of suicide."